Crystal Pite's dance troupe Kidd Pivot evokes the toll of war. Kidd Pivot dancers get all wound up. Conceiving of a dance performance as an ephemeral experience, something created and destroyed all in the same moment, is nothing new. But for Vancouver-based choreographer Crystal Pite, creating a contemporary dance work to express that notion led to a vastly different outcome. 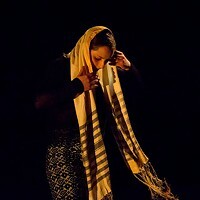 In Pite's Lost Action (2006), her choice of a conflictual and combative movement vocabulary suggested something headier than her original premise; it suggested war. Pite and her company, Kidd Pivot, perform Lost Action Sat., Oct. 3, at the Byham Theater -- one of its first performances in the U.S.
Pite is a former dancer with Ballet British Columbia and William Forsythe's Ballett Frankfurt. 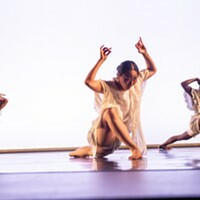 She founded Kidd Pivot in 2001, as a vehicle for her choreography. The company's moniker reflects her chosen style: one of contrast, blending the reactive and unpredictable movement of boxing with the precision of movement on a pivot point. A critical success in Europe, until recently Kidd Pivot has had relatively little exposure in the U.S. outside of scattered performances in the Pacific Northwest. Pite hopes the current U.S. tour, which began with stops in Nashville and Columbus, will bolster the company's visibility. Pite chose as the company's calling card the 70-minute, intermission-less Lost Action. In it, she creates a world where the ills of war and conflict are mixed with images of rescue. The repetition of motifs creates a sort of déjà vu, and alludes to our historical relationship, as a race, to war. Talking from her home in Vancouver, Pite says that in 2005 she decided to alter the work's initial premise following a conversation with a stranger about the meaning behind Canada's Remembrance Day (akin to Veteran's Day in the U.S.). Pite then incorporated images of soldiers and war. "I lost heart with the idea a few times during the creative process, though," she says. "I didn't feel I was mature enough as a choreographer to tackle such a daunting and terrifying subject. It is something you really don't want to mess up." Seen on video, Lost Action seems dark and anguished at times. Seven dancers (including Pite) grapple with one another and resurrected fallen comrades over and over. The original score, by Pite's long-time collaborator Owen Belton, is part of a dense soundscape that enhances Lost Action's chaotic and dreamlike atmosphere via nature sounds, spoken word and an eclectic array of ambient music. Beyond Pite's initial trepidation over adding an underlying theme of war to Lost Action, Pite also had to deal with performing in the work while choreographing it. "Because I have to do all the other things that make up a show, my time as a dancer in a new work happens mostly in the beginning, in order to establish the work's movement vocabulary. After that I end up not dancing much," says Pite. "Working that way is not ideal, but I always try to leave myself a few windows in a piece to insert myself as a dancer." In the end, Pite feels she met all her challenges with Lost Action, a work she says "is a personal and non-political statement concerning war."